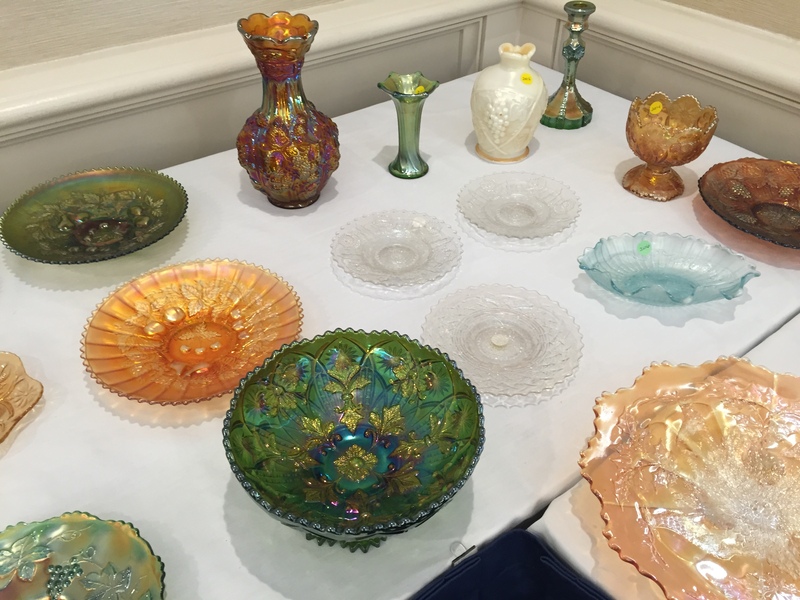 Cal here, reporting from the Brimfield antique shows and the New England Carnival Glass Association Convention in Leominster, MA. Bob Henkel, SGS VP, and I arrived in Massachusetts on Monday night and hit the fields at Brimfield at 530 AM on Tuesday. We walked and shopped for the next 11 hours. I’m sorry to report little carnival glass and even less stretch glass of any significance at Brimfield. Maybe some of those who got on the fields before we did found some stretch or carnival glass, but we did not find anything to write home about in those categories. That is not to say, however, that we did not make some purchases. It is difficult to be in Brimfield with 17 different shows and not find something of interest. Early glass is plentiful at these shows as is china, pewter, silver, furniture, art and collectibles of all types, from all periods and in all price ranges. The shows, once again, did not disappoint and by Friday noon we had nearly a full truck of boxes of purchases plus 10 boxes of stretch glass which would be the “show” in my “show & tell” banquet talk on stretch glass. We arrived at the Convention hotel on Thursday in time for the pizza party, meet and greet, the early room sales and a few of the room displays. This was our first time at this convention and we were surprised and pleased to find a number of SGS members were also in attendance. Once again, the inter-relationship between carnival and stretch glass was confirmed. There was even a room display comprised of wisteria stretch glass, stretch glass JIP bud vases and other stretch glass. We got right into the spirit of things by purchasing a couple pieces of beautiful carnival glass. Friday we returned to Brimfield for our final morning of shopping. On Friday afternoon we set up about 150 pieces of stretch glass in the banquet room in preparation for my talk on stretch glass after dinner. Unfortunately, I forgot to take photos of our display. Maybe someone who was there will have some photos and will share them later this week. My talk covered the technicalities of how stretch glass was made as well as a host of other information about stretch glass. 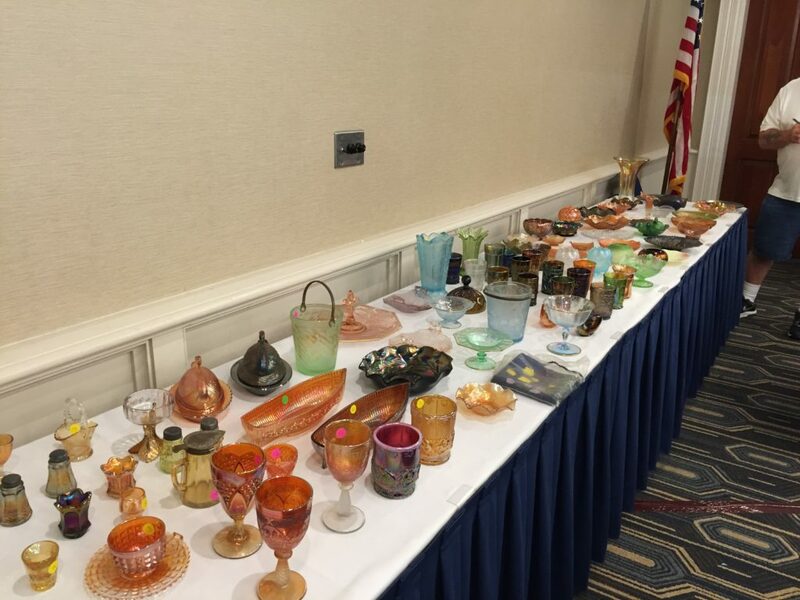 Since the audience was carnival glass collectors who typically identify glass by pattern names, I made a special effort to talk about the patterns in which stretch glass can be found – Adams Rib, Floral & Optic, Dolphins, Melon Rib, Concentric Ring, Diamond Optic, Expanded Diamond, Barbella, US Glass #310 and 314 and others. 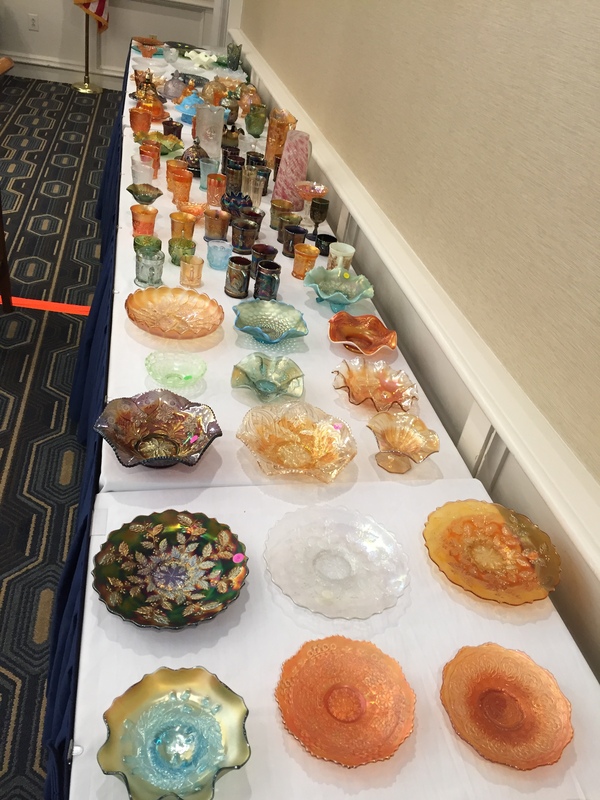 The audience was quite receptive and had lots of great questions and, of course, revealed that many of their carnival glass collections include quite a bit of stretch glass. On Saturday Steve and Gary gave a wonderful presentation on Imperial Glass from the founding of the company to the final closing days. I learned a lot and I’m sure everyone else did as well. 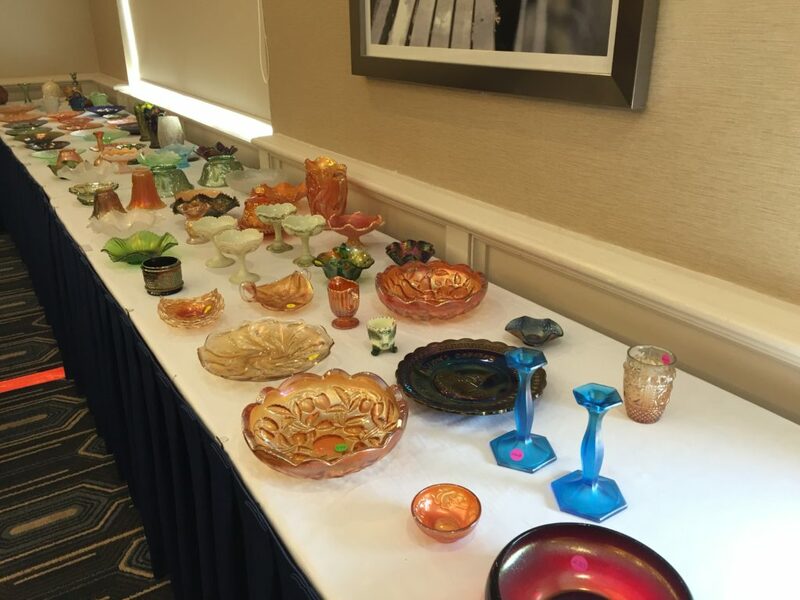 Later in the day Tom Burns treated us to an auction of wonderful carnival glass plus a few pieces of stretch glass. I was quite impressed by the iridescence on a number of the pieces of carnival glass – some of them just took my breath away. 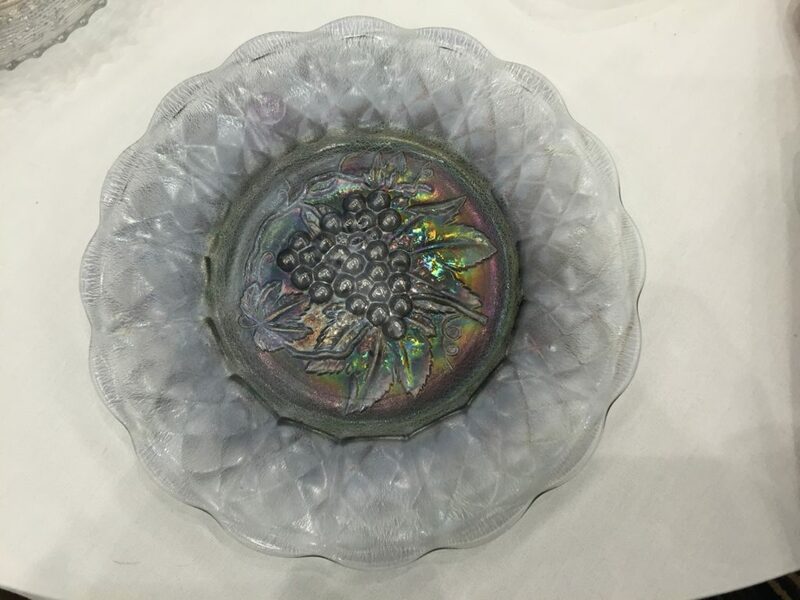 I’m now the happy owner of my first “real” ‘crossover’ piece, a chop plate in Heavy Grape with wonderful Blue Ice stretchy iridescence. The iridescence is as stretchy as can be. Everyone seemed to have a good time and take home something of interest, which is what makes for a good auction. Maybe some of you were absentee bidders, there certainly seemed to be a lot of them and quite a few of the lots were won by absentee bids.